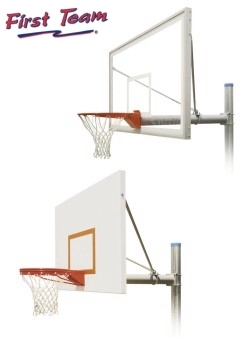 Post to backboard extension distance is 48"
The Renegade offers commercial durability and the added flexibility sometimes needed on the playground. The Renegade post is constructed of 4 �" O.D. galvanized schedule 40 tubing. The post buries into the concrete a full 48" deep. A vinyl top cap seals out mositure. The extension arm on the Renegade is attached to the vertical post using two heavy duty U-bolts. Though the Renegade is considered a "Fixed Height" goal, the U-bolts can be loosened, allowing the arm to be reattached at any given height along the post.